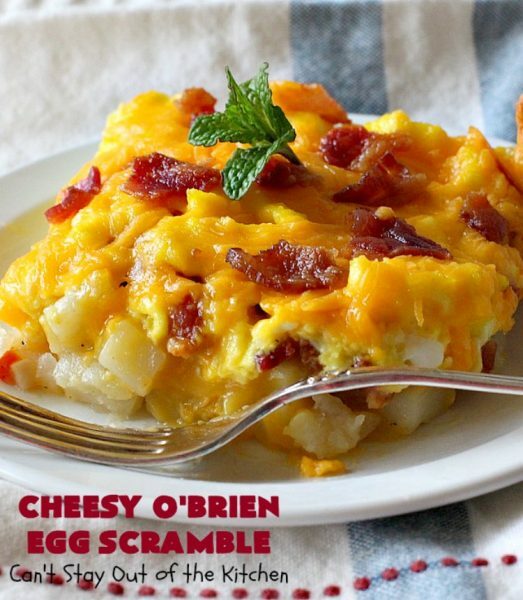 Cheesy O’Brien Egg Scramble is just so, so good. This breakfast casserole is always a hit when we make it. The bottom layer consists of fried, then seasoned O’Brien potatoes. That’s topped with a can of Cheddar Cheese Soup. The next layer is bacon. LOTS of bacon. 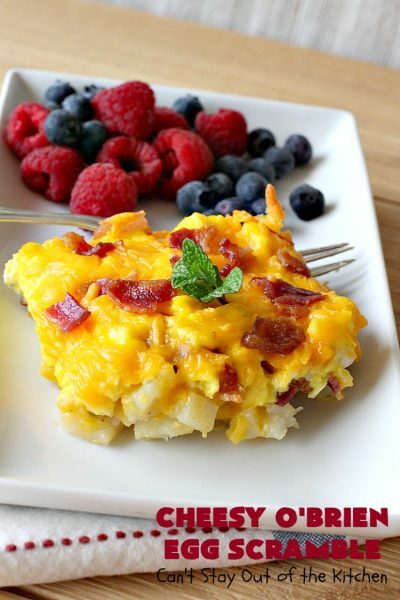 🙂 That’s topped with a layer of scrambled eggs that are not quite cooked all the way. The last two layers are shredded cheddar cheese and more BACON! 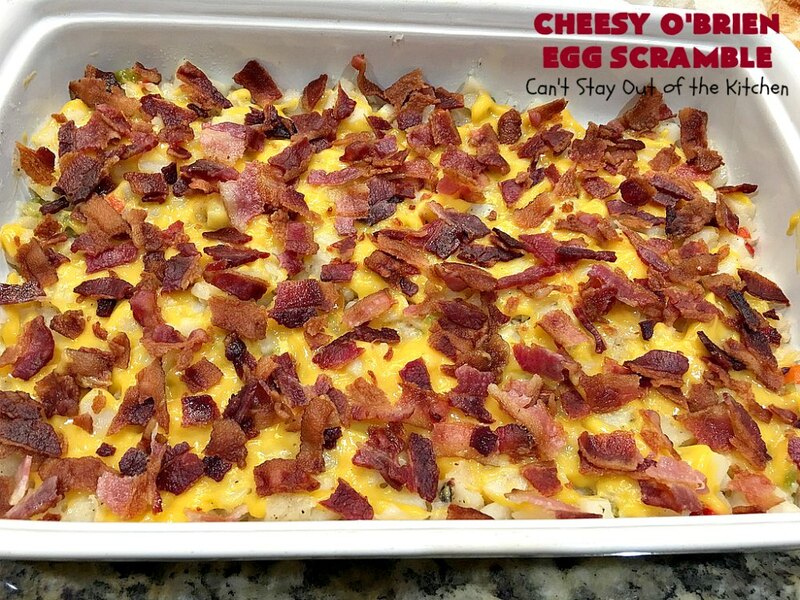 It’s a drool worthy recipe you are sure to enjoy. I made this breakfast dish a couple of times in February. Once for our Friday night care group. They raved and raved over this amazing egg dish. I also made if for our young adult group. I had so many different types of breakfast foods for both groups (including homemade donuts). But this is the dish everyone kept coming back for. Yes, seconds and even thirds! It was a winner. Years ago, I worked at Dallas Baptist University trying to get my boys through college. 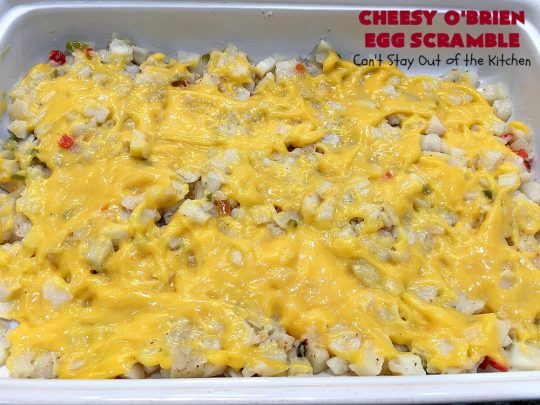 One of the gals in our department (also someone I knew from church) made this dish for one of our Friday breakfasts. I worked in the Financial Aid office and every Friday we would take turns making breakfast for the whole department. It was so much fun and I ended up gathering lots of delicious recipes that way. Becky brought in this recipe and everyone loved it. I begged her for the recipe which she gladly gave me. The recipe actually looks more difficult than it really is. If you think of it like just making layers, it’s really pretty easy. The most difficult part is only partially scrambling the eggs. That’s because they will cook the rest of the way while baking the casserole. You don’t want them pre-cooked to the point of dryness. 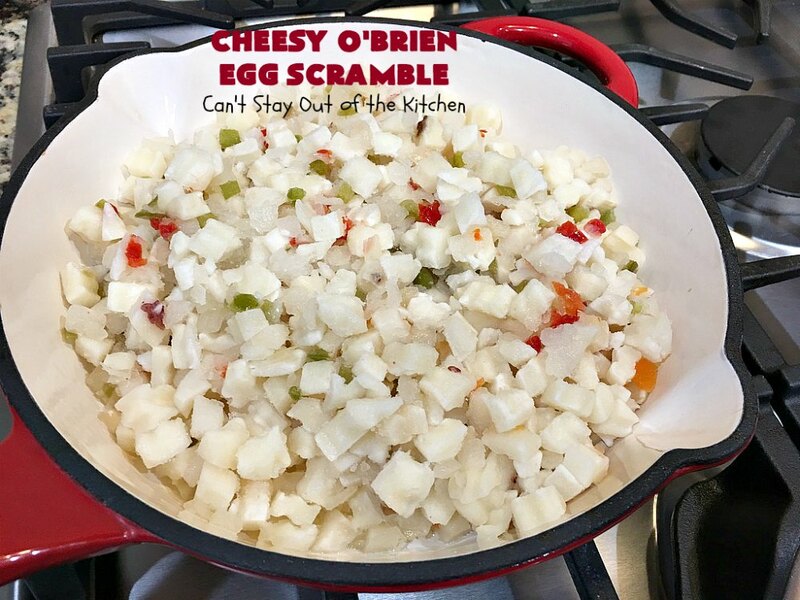 Cheesy O’Brien Egg Scramble is the perfect dish for Easter breakfast, Mother’s Day breakfast or even Father’s Day breakfast. Here are some tips to save time. Cook the bacon the night before and have it broken in pieces so it’s ready to go. Fry up the potatoes as well. Then all you have to do is layer the casserole and partially scramble the eggs. If the other parts are done, the casserole can be oven ready in about ten minutes. It only needs to bake about 20-30 minutes. 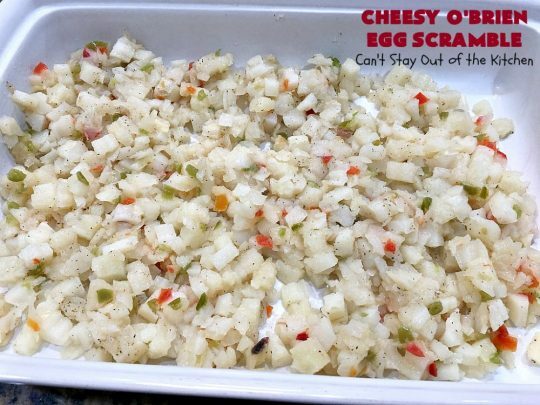 In less than an hour you can have one terrific breakfast for holidays, company or weekend breakfasts. 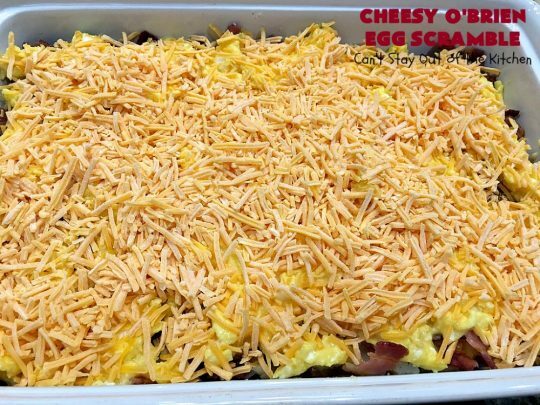 Cheesy O’Brien Egg Scramble is one of our favorite breakfast casseroles. This is terrific for a holiday breakfast. Every bite of Cheesy O’Brien Egg Scramble will have you licking your lips. Pour a little avocado oil into a skillet and heat to medium heat. 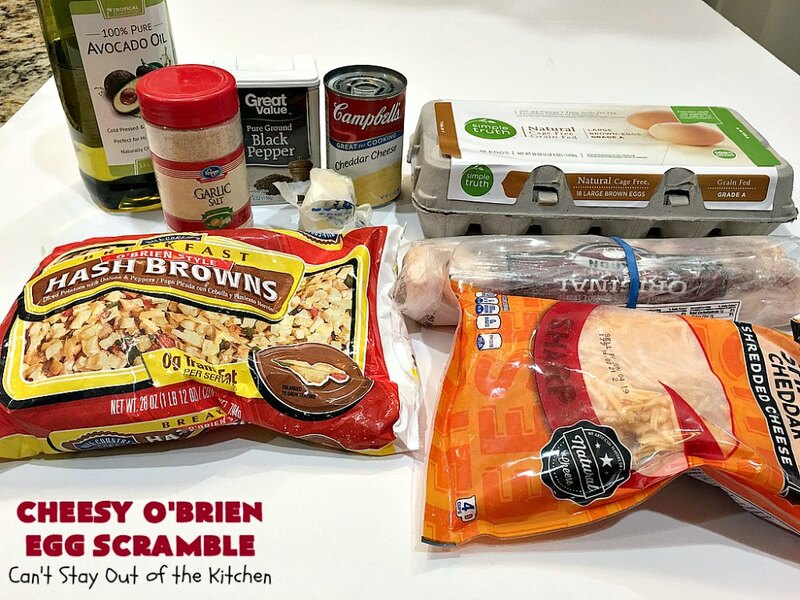 Add O’Brien potatoes. Stir and saute a few minutes until potatoes are cooked through – about 5 minutes. Sprinkle with garlic salt and pepper. Stir to combine. Spray a 9×13″ baking dish with cooking spray. I used avocado cooking spray. Evenly spread O’Brien potatoes over top of prepared baking dish. 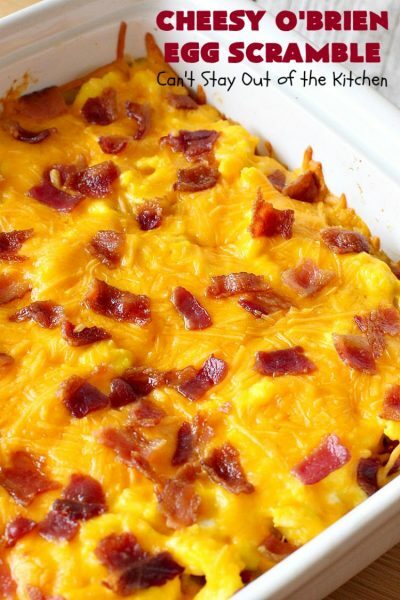 Evenly smooth a can of condensed cheddar cheese over top of potatoes. Sprinkle cooked bacon pieces over top of cheddar cheese soup. Break 12 eggs into a mixing bowl. Whisk until scrambled. Fry eggs in butter over medium heat until about 3/4 done. If you look at the picture above you will see the eggs are still moist. 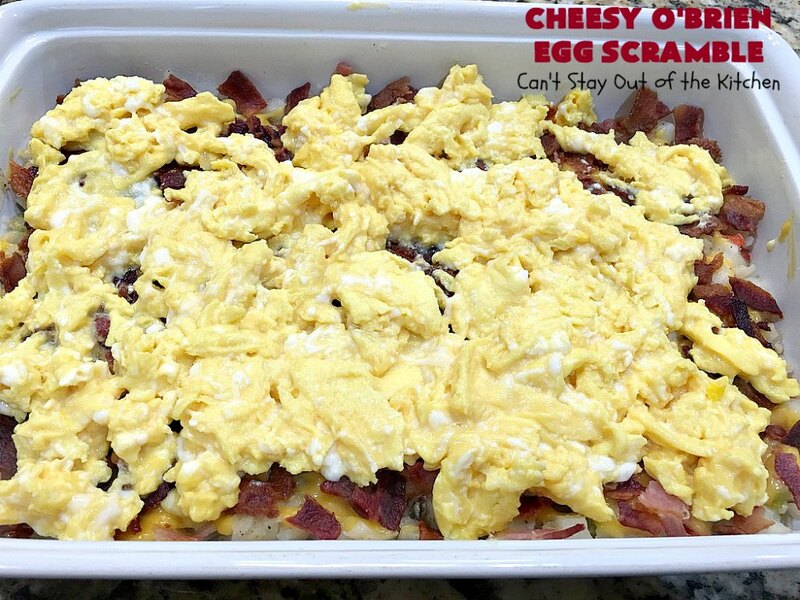 Spread partially scrambled eggs evenly over top of bacon layer. 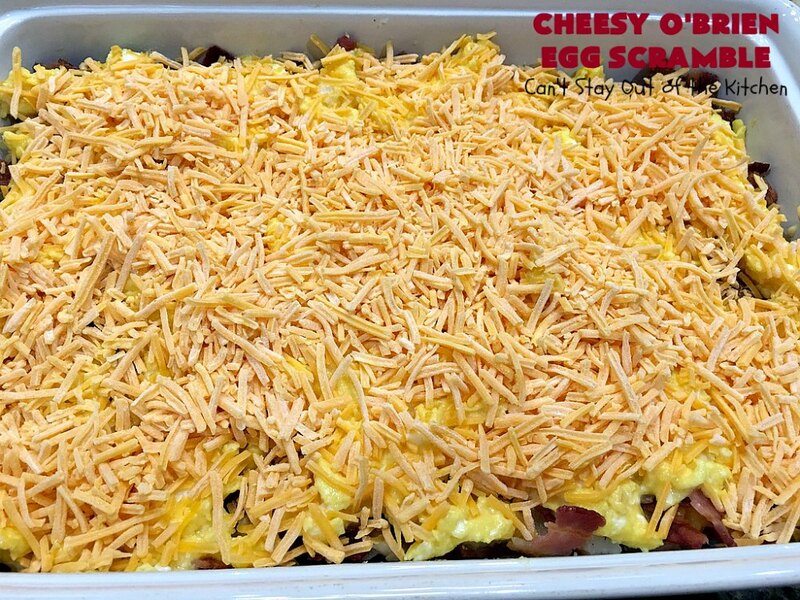 Spread cheddar cheese over top of egg layer. 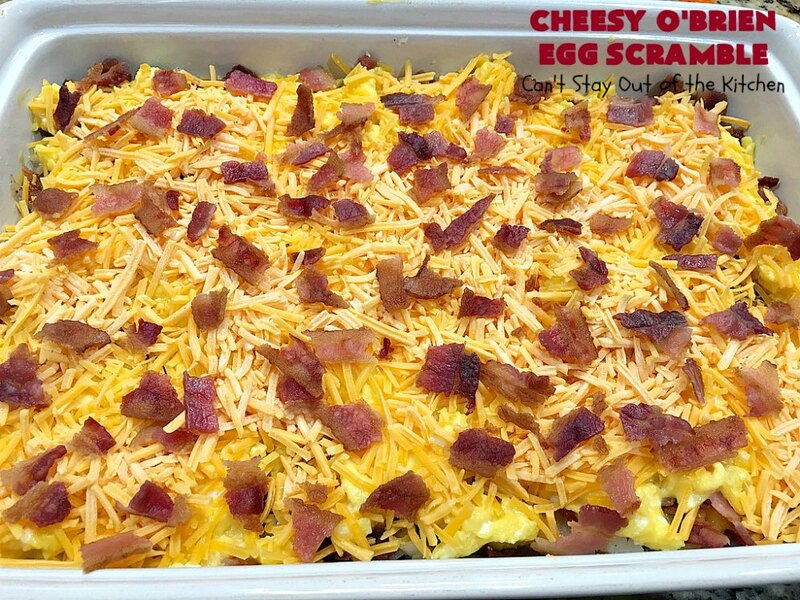 Sprinkle remaining bacon pieces over top of cheese layer. Bake 20-25 minutes, uncovered, or until casserole is heated through. This casserole is absolutely awesome! 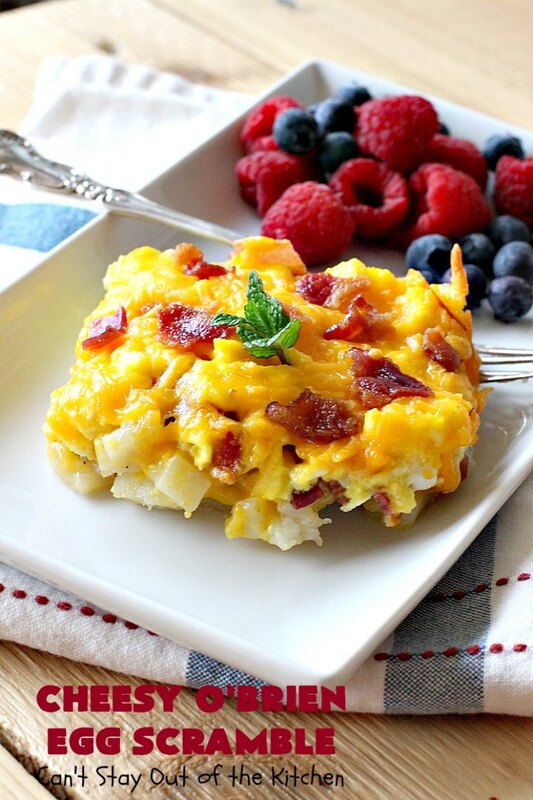 Cheesy O’Brien Egg Scramble is wonderful as part of a country style breakfast. 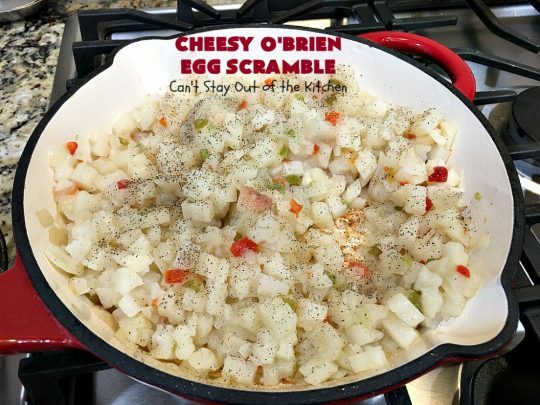 Cheesy O'Brien Egg Scramble is absolutely fantastic! This layered breakfast casserole includes seasoned O'Brien potatoes, scrambled eggs, two kinds of cheese and loads of bacon. It's terrific for a holiday or company breakfast like Easter or Mother's Day. Everyone always comes back for seconds! In a large skillet, prepare hash browns according to package directions. (I used the avocado oil for this purpose). Transfer to a greased 2 ½ qt. or 9x13” baking dish. Top with condensed cheddar cheese soup. Sprinkle remaining bacon over soup. 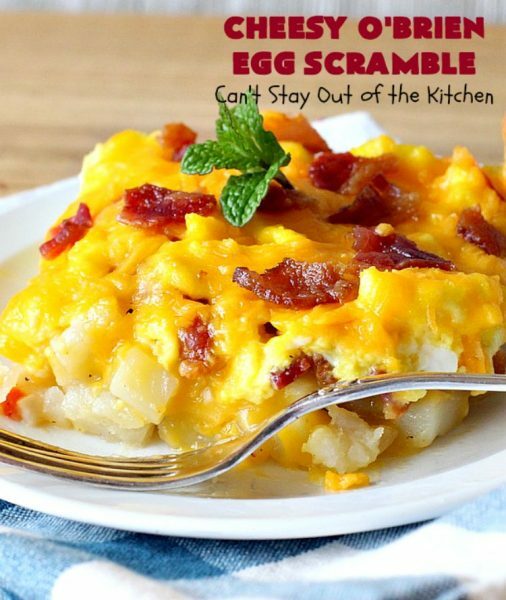 In another skillet, scramble eggs in butter until nearly set. 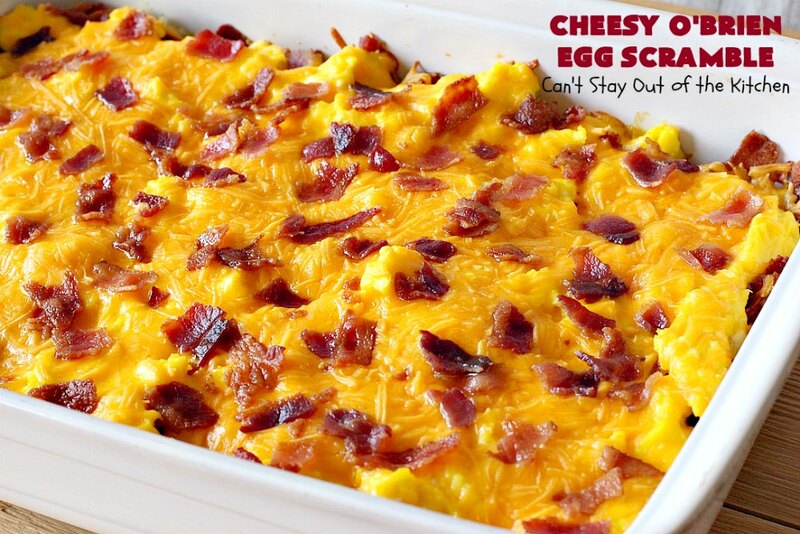 Spoon partially scrambled eggs over bacon layer. Sprinkle with cheddar cheese and reserved bacon. Bake, uncovered, at 350° for 20-25 minutes or until cheese is melted. NOTE: I used 4 slices bacon for the top. NOTE: Preparation time does not include time required to cook bacon. 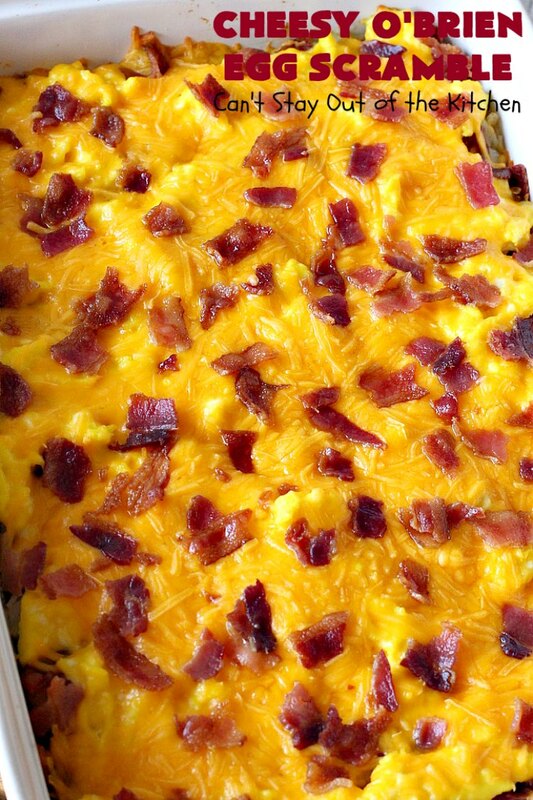 Cheesy O’Brien Egg Scramble is loaded with bacon. Bacon makes everything better. 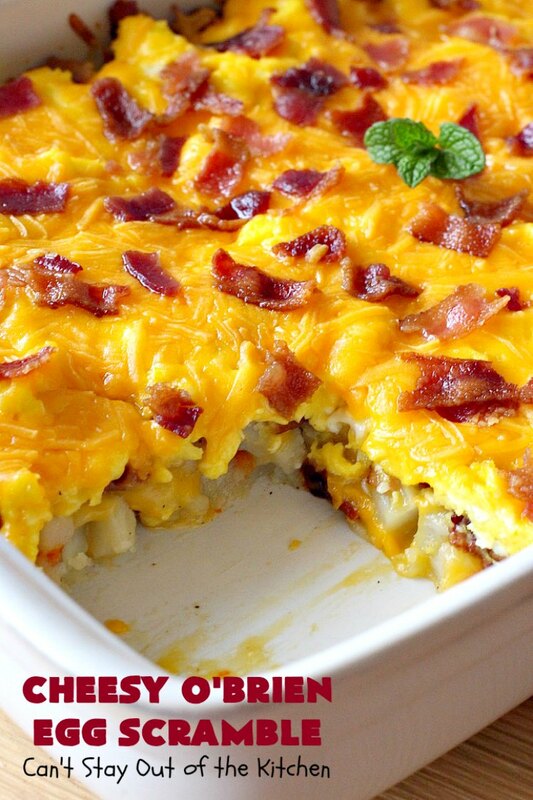 The combination of potatoes, two cheeses, bacon and eggs is so mouthwatering. Cheesy O’Brien Egg Scramble is perfect for Easter breakfast.